Reach new heights of style by adding the Heartwood Redwood Skyscape Bird House to your backyard. The extended body and tall, stacked roof of this piece create a bold statement in your garden, furthered by its cypress construction, redwood hue, and wealth of shingles. The rectangular base of the home flares slightly outward from the tapering body, and its stepped form creates perching and landing spots for your feathered friends. The 1.5" diameter entry on the front panel enables bluebirds, chickadees, or wrens to access the unit, and the flat façade deters house sparrows and swallows from roosting. The generous roof overhangs the entry hole, helping the interior remain dry, and a panel on the back of the abode may be removed for nest checks and cleaning. A copper roof cap meshes with the soft red tones of the wooden shelter, and flashing along each corner lends strength to the piece. The cypress shingles bring striking architecture to your garden, and the painted striations on the home's body mimic bark. This cleverly blends manmade design with natural forms, for a truly remarkable addition to your bird garden. Place this unit on a 4 x 4 post (not included) with the included mounting plate, for a versatile and classic display. 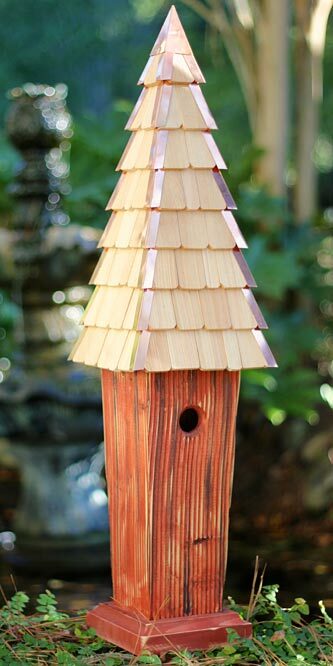 Make your feathered friends a highlight of your landscaping with this Redwood Skyscape Bird House. Made in the USA.